Home » Posts » Why the soapsuds is useful? Soap is a useful object in the house. If there are small pieces after use, they can still serve in the household. Why use the soapsuds? For those who are engaged in sewing, soap pieces-soapsuds can serve as chalk for scribe lines of patterns. These lines are clearly visible at the time of cutting and erased completely when washed. From the small pieces soap you can make a pincushion. Put a square of fabric and sew as filling for cushions. The needles are lubricated for easy handling. If the screws are lubricated with a soap, they can be much faster screwed into the wood. Pieces of fragrant toilet soap can be spread in a box with bed linens, towels. The fresh scent remains for a long time. Such natural flavor fights in the home against mustiness or other unpleasant smells. It happens that one of the boxes started badly putting forward. To correct the situation simply grease inside the box with soap suds. No doubt, it will be easy to move again. In cold weather, when is necessary to seal the windows, paper or fabric strips are glued with soapy water, usually from the soapsuds. The soap glue leaves no marks. If you collect all the soapsuds, grate and mix with a hot water and a teaspoon of glycerin, it turns to liquid soap. It can be poured into a bottle with a dropper. 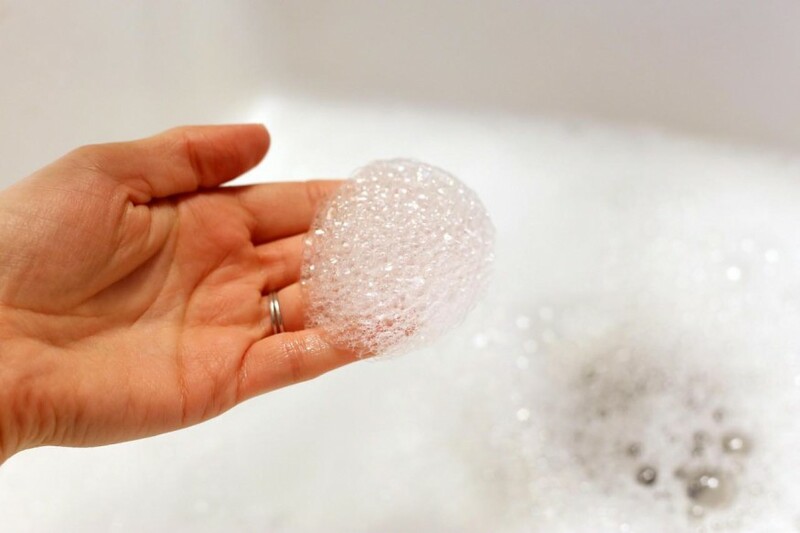 The soapsuds of laundry soap can be used for cleaning sinks, and if you add some baking soda – you will get a great tool for cleaning kitchen furniture. It is possible to make a solid soap from soapsuds. For this purpose are necessary different color soapsuds and capacitance for heating in a microwave, as well as special shapes for hardening soap. You have to take the first batch of the same color and grate it. In the obtained chips add a little hot water and place in the microwave for 15 seconds. Then remove and stir. Repeat this procedure a few times until the soap is dissolved. Do not overheat, that would not be boiled. Do the same thing with the other colors. Before the last heating be sure to add such as ground coffee, honey, flower petals, or oatmeal with aroma oils to the soap. Pour the melted soap into molds greased with vegetable oil. First pour soap of the same color, give a little to stand up and fill a different color. The soap should dry off 5-7 days. Forms for all sorts of different soaps are sold and are inexpensive. Or you can use a small size plastic packaging, such as 6 to 11 cm. And we have a beautiful and useful product, and most importantly – it saves the family budget. If, for example, you do not have a desired shape – it is possible to make soap balls. First all of they will like children. To make them, take the 100 grams different colors soapsuds, 5 grams of glycerin and 10-15 grams water. Exactly the same grate the all the colors soap together, add the warm water, stir and leave to stand for 20 minutes. During this period, the soap softens, becomes plastic. Next, add the glycerin and mix well, and after that slap the balls. Attention is drawn to the fact that the balls get a tight and do not fall apart in the aftermath. So that all the moisture has evaporated and the balls became hard, dry them in a warm dry place for 1-2 weeks. A flight of fancy sometimes leads to the creation of entirely simple but useful accessories, such as soap box – a container for a soapsuds.